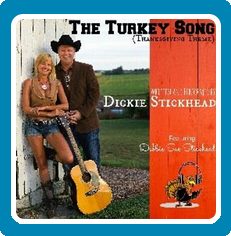 Online–Established country singer Dickie Stickhead is re-releasing his Thanksgiving hit, “The Turkey Song”, in time for the holidays. It is an unconventional Thanksgiving Song, as the narrator tries to convince listeners to eat steak instead of the traditional bird, yet it contains all the joy that the family gathering holiday should be about. Seven years after he originally wrote down his lyrics, he released the track as a YouTube sensation, with nearly 40,000 views to date. It’s no wonder, as it is full of entertainment from Stickhead’s animated singing and silly antics to the “Stick Chicks” dressed in holiday gear and demonstrating the proper way to Turkey Dance. The lively and family-friendly tune has a deeper meaning to Stickhead than just dancing like a turkey though. After crashing his truck to avoid a herd of the fowl, the song came to him in a concussive dream. The lyrics: “Gobble, Gobble, Strut, Strut” are meant to be a celebration of life and authenticity, to encourage people to eat up life and be proud of who they are, where they’ve been, and where they are going. Stickhead is accompanied on the track by his sister-in-law, Vickie (sound engineer and music composition director), and his youngest sister, Ellie May. The video features Stickhead and his wife, Debbie Sue, making both the song and video an endeavor made by family, for families. Whether you play the tune to entertain the guests while they are anticipating their meal, or play it afterwards while bellies are full, it’s sure to have people laughing and singing along and making a new family tradition. Be warned: it is infections and will undoubtedly get stuck in your head! The Turkey Song (Thanksgiving Theme) is for sale now on CDbaby, iTunes, Amazon Music, Google Play, and most major outlets. The video is free for viewing on YouTube and stay tuned to the end for a hilarious replay of “Stick Chick” auditions. For more information, contact Dickie Stickhead at dickiestickhead@gmail.com. Or, visit him on Facebook at http:https://www.facebook.com/dickie.stickhead and Twitter at http://twitter.com/DickieStickhead. Lamar Morgan is a small business columnist and collaborative evergreen marketer. Through his firm he creates marketing tools that do not get thrown away. To learn more about Lamar’s background, visit his LinkedIn profile. To learn more about his company, Synergistic Business Marketing, visit his LinkedIn company profile. To learn more about SBM’s “Better Together Approach, ” visit Synergistic Business Marketing – Marketing Florida & The USA with Lamar J. Morgan. Indeed important to follow cultural traditions.. a nice article, a nicer blog..and on a well deserving theme.. happy blogging..